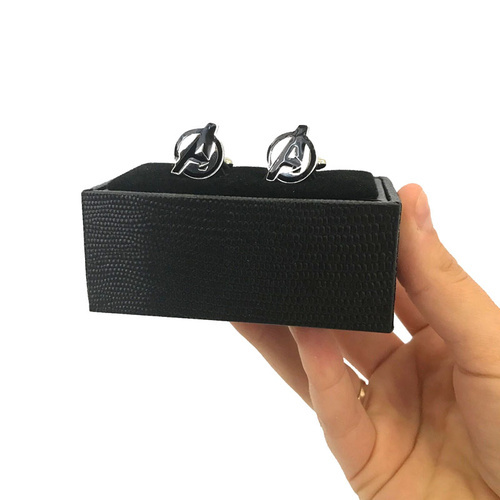 The Avengers Cufflinks | Smarten up any outfit or costume! Smarten up any outfit or costume! Fight your foes in style! Join legions of eager fans as they celebrate the Earth's mightiest superheroes, The Avengers! These stylish cufflinks feature the black and white Avengers insignia in detailed enamel with a silver, rhodium plated backing. Perfect for Marvel fans who love Iron Man, The Hulk, Thor and Captain America! Each cuff link has a bullet back closure for ease of use. Presented in a stylish black display box with velvet inserts for stylish gifting.